Beautifully engraved uncancelled gold bond certificate from the Atlantic and Pacific Railroad Company dated in 1887. 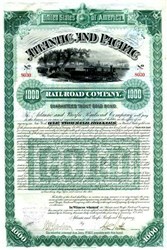 This historic document was printed by American Banknote Company and has an ornate border around it with a vignette of an old steam locomotive next to a harbor. This item has the signatures of the Company's President and Secretary and is over 129 years old. 49 coupons attached on top. The Atlantic and Pacific Railroad Company was chartered in New York state in 1852. While the formative bond adhered to the provisions of the Mississippi and Pacific Act of 1853, the bond was rejected and cancelled. A company was later chartered under the identical name by an act of the United States Congress on July 27, 1866. The railroad built the line that is today's BNSF Railway's northern Arizona/New Mexico mainline between Albuquerque, New Mexico and Needles, California. The Arizona/New Mexico route was constructed between 1880-1883. On August 20, 1884, the Atlantic & Pacific leased 242 miles of track from Southern Pacific Railroad that ran west from Needles, California to Mojave via Barstow, and later to Bakersfield. The A&P was an operating subsidiary of the Atchison, Topeka and Santa Fe Railway (ATSF). On June 24, 1897, the A&P was sold to the ATSF under foreclosure and was operated from 1897-1902 under ATSF's subsidiary, the Santa Fe Pacific Railroad. In 1902 the Santa Fe Pacific was merged under the ATSF.